SALE Starting at $1,599 More Finishes. Same Price. SALE Starting at $1,849 More Finishes. Same Price. SALE Starting at $1,219 More Finishes. Same Price. SALE $1,349 More Finishes. Same Price. Whether your preferences lean toward earthy, chic, or rustic, our collection of wood beds will inspire you to think big. We search the world over to find new and interesting designs, traditional looks, and contemporary pieces that are decorative and distinctive. When you shop Bassett, you know you’re getting the latest and greatest in wood beds. Bold and colorful, understated but elegant, stylish and serene. With Bassett, any and all are possible. Our incredible collection of wood bedroom furniture is your oasis – an exciting opportunity to escape into the bedroom of your dreams. Our custom design program gives you the ability to create the wood bed and bedroom you’ve always wanted. And, designing the bedroom of your dreams is easier than you think. The program’s many style and finish options make it possible to add your own personal, unique style to your new bedroom furniture. Once you’re ready to get started, simply make an appointment with one of our knowledgeable design consultants. 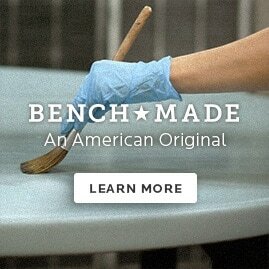 Our Bench*Made line of wood beds is made the old-fashioned way – one at a time, by artisan furniture makers. Available in maple and oak. Every wooden bed frame is hand detailed at our shop right here in Bassett, Virginia and made with painstaking attention to detail. It’s furniture the way it was intended to be made. Stop by your nearest Bassett showroom and browse our collection of wooden beds and bedroom furniture. Get inspired and create a bedroom piece that is truly unique, truly you. And know that your bedroom purchase is backed by a 100+ year reputation for quality and durability.